Robust statistics is an extension of classical statistics that specifically takes into account the concept that the underlying models used to describe data are only approximate. Its basic philosophy is to produce statistical procedures which are stable when the data do not exactly match the postulated models as it is the case for example with outliers. The methods are introduced both at a theoretical and applied level within the framework of each general class of models, with a particular emphasis put on practical data analysis. This book is of particular use for research students,applied statisticians and practitioners in the health field interested in more stable statistical techniques. An accompanying website provides R code for computing all of the methods described, as well as for analyzing all the datasets used in the book. Dr Stephane Heritier, NHMRC Clinical Trials Centre, University of Sydney, Australia. A senior lecturer in statistics for four years, Dr Heritier also has over a decade of research to her name, and has published numerous articles in a variety of journals. Dr Eva Cantoni, Department of Econometrics, University of Geneva, Switzerland. Also a senior lecturer in statistics, Dr Cantoni has many years teaching and research experience, and written a number journal articles. Dr Samuel Copt, NHMRC Clinical Trials Centre, University of Sydney, Australia. Having completed his PhD in 2004, Dr Copt has already spent a year as a lecturer and published six journal articles. He is now a visiting scholar at the University of Sydney. Professor Maria-Pia Victoria-Feser, HEC Section, University of Geneva, Switzerland. Professor Victoria-Feser has over 10 years of teaching experience and has written many journal articles. 1.1 What is Robust Statistics? 1.2 Against What is Robust Statistics Robust? 1.3 Are Diagnostic Methods an Alternative to Robust Statistics? 1.4 How do Robust Statistics Compare with Other Statistical Procedures in Practice? 2 Key Measures and Results. 2.2 Statistical Tools for Measuring Robustness Properties. 2.3 General Approaches for Robust Estimation. 2.4 Statistical Tools for Measuring Tests Robustness. 2.5 General Approaches for Robust Testing. 3.2 Estimating the Regression Parameters. 3.3 Testing the Regression Parameters. 3.4 Checking and Selecting the Model. 4.3 Classical Estimation and Inference. 5.3 A Class of M-estimators forGLMs. 5.6 Doctor Visits Data Example. 6 Marginal Longitudinal Data Analysis. 6.2 The Marginal Longitudinal Data Model (MLDA) and Alternatives. 6.3 A Robust GEE-type Estimator. 6.6 Stillbirth in Piglets Data Example. 7.3 Robust Estimation and Inference in the Cox Model. 7.4 The Veteran’s Administration Lung Cancer Data. A Starting Estimators for MM-estimators of Regression Parameters. B Efficiency, LRTρ , RAIC and RCp with Biweight ρ-function for the Regression Model. C An Algorithm Procedure for the Constrained S-estimator. D Some Distributions of the Exponential Family. E Computations for the Robust GLM Estimator. E.3 IRWLS Algorithm for Robust GLM. F Computations for the Robust GEE Estimator. F.1 IRWLS Algorithm for Robust GEE. G Computation of the CRQ. 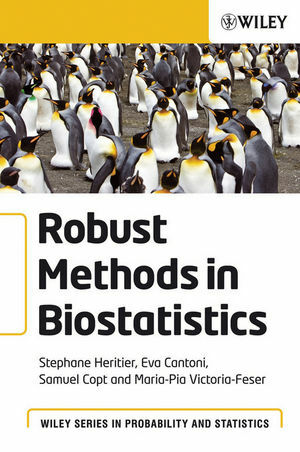 http://www.unige.ch/ses/dsec/staff/faculty/Cantoni-Eva/Books/RobustBiostat.html >Robust Methods in Biostatistics Visit the companion website to learn more about the concepts discussed in this book. First book on robust techniques to be specifically aimed at biostatistics. Introduction to each chapter and its relevant classical statistical procedures. Compares robust statistics with the classical approach. A chapter devoted to the computational aspects. Supported by an accompanying website containing data sets, programs written in R and a user guide.